22Thus [unknown] tongues are meant for a [supernatural] sign, not for believers but for unbelievers [on the point of believing], while prophecy (inspired preaching and teaching, interpreting the divine will and purpose) is not for unbelievers [on the point of believing] but for believers. It is A Great Blessing to recognize when you are in the Presence of the LORD! I was given this Word from His Spirit a few days ago. It is so sweet and enlightening. However He appears and makes His presence known-To Be able to recognize His presence is a blessing that produces so much fruit to share. It is a blessing to always recoginze Him-to be open to anyway that He so chooses to come to you, because you will not throw away, dismiss, or walk by Him in whatever Form He takes to help you! It is also a blessing to realize that you have thrown away, stopped contacting, ignored, walked by, or dismissed the things and people that He has used as vessels to be poured out for your life. Once you have realized that you dismissed what was sent to help you=Go to God and ask His Spirit to reveal to you what you are able to salvage, if you should and how you should. We can spend the day learning from our mistakes-Or-we can spend the day making new regrets. Each day we can live by His truths or we can keep ourselves on a path that is slowly killing our hearts and spirits by living in denial, being unconvinced and not converted. Our Good Shepherd, He Is Listening. He strains with an intensity of Love to hear every faint and bold cry from His Children. 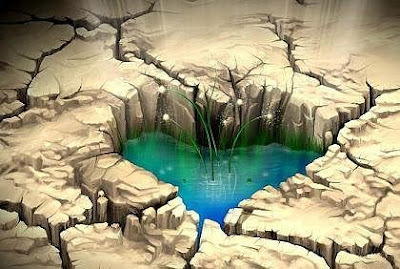 He listens closely for the spontaneous words of Love to come from our lips-which means it comes from our hearts as what lives in the heart the mouth will speak. He Listens for us, Not only when cares and concerns press harder upon already weary hearts—but to see if we would Only come to Him often, daily in quietness, in Joy, in Sharing with Him All the little happenings-Al frets and All Glad Times—we would not be so weary so rundown, so often. To keep your Spirit-Life calm and unruffled is all that matters. Leave All to Jesus and this is our great task-to Get Calm and to Stay Calm In His Presence. To be able to hear Him and then to obey His directions completely-not for one moment allowing anything or anybody to distract you, is the result of spending quiet time with Him and you to be strengthened for all that is to come your way. To focus on 'not blocking' His light that shines from us for others to see. Our Charge is to stop all else until the peace and quietness, until absolute calm comes over and in you. Any blockage means His power will be diverted into other channels. 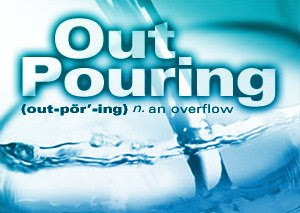 We are to Pour Forth-Pour Forth-Pour Forth everything that He gives us. Jesus cannot bless a life that is unwilling to be a channel for Him. This is to fully abide in Him – to focus on how many people you can bless each day—Not by keeping a list-but by dwelling more in His presence. Wanting to be taught and changed willingly. I thank God for His Spirit leading those Called, Tried and True to be His Prophets. These are the people that others dismiss, throw away, ignore, and call crazy. I am thankful that I have a discerning spirit to know Who they are when I cross their paths. Those of us willing to allow God to use us, know the sting that weak believers and non-believers can cause. People who seem to have stopped growing or are not in a community of faith that teaches about God’s Prophets of Intercessory. Those that ride shotgun with us. God calls prophets to be intercessors; to go ahead of-along side of-to guard that which is on the way—in transit. To be alert. 9"With it we bless the Lord and Father, and with it we curse men who were made in God's likeness! 10 Out of the same mouth come forth blessing and cursing. These things, my brethren, ought not to be so." Many in the body of Christ have not been taught about these people that are called to be His messenger. Not taught in the belief that God still uses Prophets. So they may dismiss a person who comes with a Word or two or three from God. This is dismissing the power of God-to ignore the out pouring of God through the vessels He has chosen to use. God will use any and every Way He so desires to get us the understanding of what He is teaching us. He may use the wind, birds, strangers, neighbors, children, friends and family members, co-workers, our enemies, a commercial on t.v. He can use the hurt and pain of another, someone’s Joy, Peace and Strength to speak to you about your own life. Many do not understand the power of the tongue. They use it to cut off what God is speaking to them. “It’s not what I want to hear.” “But this is what I want to know.” Or, they begin to change the subject from the point of the message being spoken for their benefit. This is not a good idea. Whether you understand the message being given or not is not the point—the point is to receive the message and then go pray about it and God will provide everything you need to have full understanding and wisdom from the message. It Will bear fruit if you allow it to. There is a lack of spiritual maturity and a desire to grow the way God wants them to grow. They are not able to let go of what is dead—what they have given power to and have convinced themselves they draw strength from—only to ignore What is blocking their way forward. The truth they need to face. We all do this—but there should come a time and place when a person gets tired of this living this way. It is stagnation. Running in place being busy is not the same as obeying the directions He gives us and then being occupied with our Fathers Work. Jesus teaches us to start at the beginning and begin to allow Him (by letting go) to cut away the dead things from our yesterdays. Then will we be able to start with what we have—As it is not possible to start with what we don’t have. 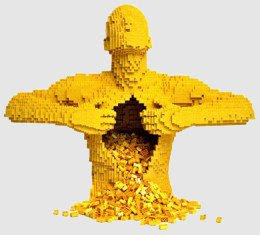 Search your heart—look around-are you holding on to relationships, ways of thinking, and acting/re-acting that God either has cut away or is trying to cut from you? Have you dismissed the new relationships, the new ways of seeing and thinking, of doing, of not doing that He has brought forth into your life? Are you blocking His Will to prepare you for what He is going to bless you with? To be prepared before the blessings arrive is an assured way be able to hold onto them and see the Fruit produced by them. Or, they will come and you will not be prepared for them. Allowing Jesus to cut away people and bad habits that may tempt you to give them away or allow them to be stolen, is why it is best to allow His pruning of your life to happen. Has He given you a Prophet to help you embrace and to learn the value you must have to Him? Have you thrown away that person sent to help you by thinking with your old ways; that you don’t need to hear or know what they have to say? Look around-become balanced by dwelling with Him—drawing closer to Him as He draws closer to you. Understand that He will send these people to ride shot gun with you as you are in transit—spiritually moving from One Glory to the next. When you are in movement-in transit, you are really going to need the Lords protection as there is much up ahead that you may not have any idea about or how to handle it. You may not be spiritually mature enough to know of or see – to anticipate-it may never cross your mind that there is a remote possibility that these bad, terrible, evil, stupid things could happen to you. Many situations that we find ourselves within were not All done to us by our enemy—OH, now he does do his share of evil works to us—but most of messes and mazes we find ourselves within, comes from our own hands, our own thinking, and our own hearts. From our inability to let Jesus help us fully. It has to do with being convinced but maybe not converted. See, it has crossed Jesus’ mind that you will need help—And He Sends the kind of HELP that He knows Will save you and provide the best protection for your travels. He will call forth a prophet intercessor to ride shotgun with you. Go back and see if you were sent the help you need, but dismissed them. It is truly a Blessing to be able to recognize the presence of the LORD! Amen! Lessen yourself so that He may be Increased. Thank you WTM for your encouragement and the courage to follow the path God has for you - in Jesus' name. This is a powerful Word. One that many will run from. Seems like God keeps sending folks the same prophet, same task until they stop running and obey Him. Once they do that they can move to the next task, enjoy the new blessings.